Canada has long been known as a country that welcomes immigrants from around the world and many children of immigrants have found sports to be the catalyst to integrating within their new community. Football is one sport starting to make inroads with newcomers. Players like former CFLer Ibrahim Khan and current Toronto Argonaut Jas Dhillon represent communities that haven't normally played the game. Sukh Chungh, the seventh-ranked prospect in the 2015 CFL Draft, is hoping to join this list of players in the CFL next season. "I believe we're coming up now. There's not many of us right now but there's many more in our community to get into sports like hockey, football and basketball," Chungh told TSN recently. "A lot of new immigrants are making it to the professional level which is very nice to see." For many newcomers to Canada, the game of football itself has many facets and rules that can be complicated. For Chungh, whose parents immigrated to Canada from India, there was a learning curve for his family when he first started playing the game. "It's still an issue so far. They've come a long way from when I first started," Chungh stated. "My Mom and Dad they do understand the sport now quite a bit but when I started it was real foreign to them." Chungh started playing football in the 9th grade at Terry Fox High School in Port Coquitlam, B.C. While he had raw talent he also possessed incredible potential and power setting school records in various lifts like the bench press and squat. He also showed well on the field being named a two-time lineman of the year at Terry Fox and getting invited to USA vs. The World football challenge in January 2010. During his time in high school he was heavily recruited by Blake Nill at the University of Calgary who invited Chungh to team dinners whenever the Dinos were playing at UBC. "He's an unbelievable football player," Blake Nill told the Calgary Herald back in August of 2011. "I think he's a future first-round (Canadian Football League) draft pick." Nill's recruiting paid off and he may be proven correct about Chungh being a first round pick, too. 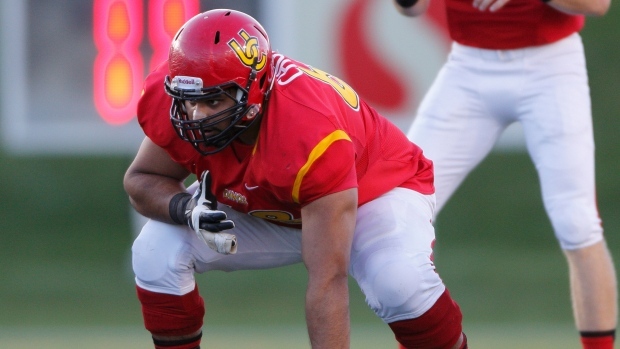 The 6' 4" 300 pound Chungh became a starter in 2012 for the Dinos. Playing at guard he was named a CanWest All-Star and a CIS All-Canadian in 2013 and 2014. "Sukh paired with Sean McEwen were perhaps the most formidable duo in the CIS in 2014," Nill told TSN. "Sukh is big, powerful and plays with an edge. He is a brawler who will not back down from anyone." "I believe I bring a little bit of nastiness to the table," Chungh agrees. "I like to get after it and really put the shift on and go to work to get to grind mode." For his part, Chungh considers signing with the University of Calgary to be the highlight of his time there. The school showed patience with him early as he couldn't play in his first year because he was academically ineligible. He improved his grades and got on the field in 2012. He credits his former coach for helping him on and off the field. "Off the field he was always there when you needed him. You could give him a call with any type of deal that was going on in your life. He would always seem to find out or helped you find out the answer," Chungh remembers. "I just learned a lot from how Blake Nill preaches his program. He always tells us we got to take care of business. Blake's just been a great influence on my career as a man and he's really helped me grow." He was also influenced by former teammates. Calgary has had great success during the Blake Nill era sending several players on to the CFL and Chungh learned from this group when he went there. Guys like Quinn McCaughan, Kirby Fabien they always had a great influence on me. They took me in pretty good when I was a rookie. They didn't haze me too much," Chungh recalls. "They taught me a lot about how to carry myself. I lived with (Linden) Gaydosh for like three years and that's definitely had an influence on my football career." Chungh made sure to add. "There's been great draft classes before us and guys have definitely done well. They've left big shoes to fill so we definitely take pride in representing the University of Calgary and definitely representing how the program is conducted here." At the CFL Combine in late March, Chungh is looking to show teams his size and strength and that he can move well. His former coach thinks teams will like what they see. "During Sukh's time at UC his maturity improved substantially," Nill said. "He will impress the pro-scouts immensely, and will be difficult for (anyone) to pass on during draft day." Our next player profile will be on Offensive Lineman Danny Groulx the No. 8 ranked CFL Draft Prospect from the University of Laval.